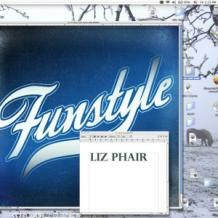 In 2010 Liz Phair digitally released Funstyle from her website. The sixth album was then packaged with Girlysound as a bonus disc. Funstyle is ... well, you decide? "If you are looking for the new Exile In Guyville you are not going to hear it on Funstyle! But you will hear a collection of songs that step in a completely new direction!" "One thing is for sure, you don't have to be a Liz Phair fan to love or hate this album!" Liz Phair has got total control of what music she wants to release to the world. There sure seems to be a distinct middle finger raised at the music industry and her enemies. This album is tough to take in the very first time. I know that you can say that about many albums but this one in particular. This is nothing like any of the last albums if you were wondering. Funstyle is experimental by every stretch of the imagination. It starts off with Smoke which sets the standard that the album is going to be a parody of songs that are done in the style that Liz likes and that's that. Liz opens her lyrics "Hey Liz, what's in the box? What's in the box? It's my little voice of self-doubt." There is a rap song in Bollywood (yes with a Bollywood beat jangling in the background) which was the preview track released for the digital release. It is a very catchy song, a totally crazy step aside from everything we have heard Liz ever do. An attack on the current music industry is a good way to describe this. You Should Know Me is the first song where you listen and go ... wow! This again is nothing like the beginning of this album. It is one of the standout tracks and could be compared with some of Liz Phair's greatest work. It is Liz at her best as it is uncomplicated. Then along comes Miss September. This is also a sweet track which is accessible to the lighter direction of how Liz Phair is a good song writer. She can write exceptional love songs which is evident from previous albums. My My is a fun song. It has a catchy chorus that is another style change making the album sound like a mix tape of various genres. This is kind of R&B. Oh, Bangladesh is the standout track of Funstyle In My Opinion. It is well constructed and aside from the joke. It would be a single if the album ever gets explored beyond the fans. Now we start to go silly again... Funstyle is very mismatched. However, very interesting. Bang! Bang! is how some of the fans of the last albums are going to feel about now. Beat Is Up continues to challenge the listener. Using sound clips from a strange Indian man and life as a Chicago housewife. It is a laughable song as the beat is drubbing off in the background. And He Slayed Her. You have got to laugh at these song titles. This is definitely one of the best tracks as it is honest, pure and again well constructed. If you were to make a mini EP out of this album this would be included. Satisfied is along the lines of Liz Phair's last work. What makes no sense is that it is pretty clear that if she wanted to she could put an album together very easily with tracks like this one. Perhaps, this is the whole trick to Funstyle itself. Satisfied is a good song. U Hate It... this one is almost self explanatory. It is asking the listener if you liked it/hated it. Does it matter? It costs $6 it is out there, it was fun at times. Does anyone care? You just have to take what you can out of Funstyle and dismiss what you don't like as it is uneven in style but fun nevertheless. Here are some of the songs below ... now you be the judge and let us know what you think?